My goal as your massage therapist is to help relieve your pain, and in many cases that means releasing Trigger Points. You may have heard me say, "Oh that released really well." Usually, I am referring to a Trigger Point releasing. A trigger point is simply a small contraction knot in muscle. This knot feels like a pea buried deep in the muscle, and can feel as big as a thumb. It maintains a hard contraction on the muscle fibres connected to it, thus causing a tight band that can also be felt in the muscle. When stressed or injured, muscles often form trigger points, that cause pain and tightness. Trigger Points often refer sensation to another area of the body. I say sensation, because even though Trigger Points cause pain, doesn't mean they refer pain. There are many different sensations my clients have experienced. A few include yes, pain, but also tingling, aching, sharpness and numbness. What can Trigger Points Cause? Trigger Points are often what is causing musculoskeletal pain. They are very common, and can cause referrals that may make you think something else is wrong. A few things Trigger Points cause are headaches, neck and jaw pain, low back pain, the symptoms of carpal tunnel syndrome and tennis elbow, and many kinds of joint pain mistakenly ascribed to arthritis, tendonitis, bursitis, or ligament injury. Trigger Points can also cause earaches, dizziness, sinus congestion, nausea, heartburn, and false heart pain. Apart from pain, they may cause numbness, tingling, weakness, or lack of normal range of movement. How do I know where Trigger Points are? Because Trigger Points refer pain, the cause of your pain probably isn't where you are feeling it. It is probably a referral from where the Trigger Point actually is. How do I know where those Trigger Points are? Trigger Points are predictable. And thankfully, they have been clearly mapped out in The Trigger Point Manual by Simons and Travell. We learned about all of the patterns in depth while in school. Using their maps I know which areas to search for the TPs that characteristically send pain to the place where you are hurting. I then feel for a tight muscle in that area, feel for tight bands within that muscle, and localize an area within the band which is exquisitely tender and that is the TP. As I press or twang it, the muscle may twitch. As I keep pressure on it, it will cause your usual referred pain, thus confirming that we've got the spot. I will continue to use pressure on that spot until the Trigger Point releases. Sometimes they are stubborn spots that take a while to release, so I may come back to the area. An example of a few Trigger Points and their referral patterns. 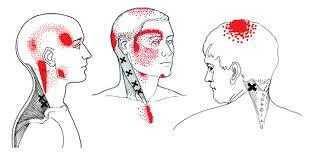 The x marks where the Trigger Point is located and the red dots mark where the pain is felt. Trigger Points are very common, may cause pain you thought was unrelated to muscle issues, but very curable. I can help you treat and release Trigger Points through therapeutic massage. I love to figure out where pain is coming from. It doesn't matter if you have headaches or back pain, it's all fun!